From his enlistment in Galt Ontario on February 14th. 1941 until becoming the skipper of a bomber crew over Europe would be a long journey, one of constant training that was laid out for RCAF pilots. The first step towards becoming a pilot for the nineteen year old Anderson would be to pass the examinations at No.5 I.T.S. (Belleville Ontario). Among the scholastic and physical testing carried out there the recruits seeking pilot training would take a series of sessions in the Link trainer. Being able to fly an aircraft was only one criteria, the hopeful pilot would undertake a series of psychological tests as part of the selection process towards being a pilot. Tests were also conducted to see if the candidate could work out problems while subjected to stress. One such test was to have the men placed in a decompression tank and slowly lower the amount of oxygen all the while working out puzzles and calculations. The testing varied over the years to meet the requirements of the change in aircraft and and crew needs. The selection process did not end after his time at I.T.S. throughout the lectures and actual flying time while at No. 13 E.F.T.S and No.5 S.F.T.S. he like the other student pilots was under the constant glare of their instructors. Being at this stage did not necessarily mean the student would not be "washed out" and reposted to another aircrew trade. While not being able to locate William Anderson's instructor's comments. In the dozens I have seen the instructors comments were never a glowing account that his students would have liked to have received. Most of these I have reviewed on other 419 pilots, contained remarks such as "average pilot" , "slightly better than average pilot" and these men would later more than prove themselves over and over in combat. One indication of how well a student performed was the bestowing of a commission at the end of the course. At the end of his S.T.F.S. course he was now P/O William Anderson. The training never stopped for the airmen, their lives depended on it. And for pilots, their crew's lives depended on his abilities. Advanced (Pilot) Training was followed by posting to an Operational Training Unit. It would be here where P/O Anderson would put together the beginnings of his crew and move on from the smaller aircraft to the Wellington bomber. The next step was to the Halifax four engine heavy bomber. Many airmen who have written about their first glance of the Halifax expressed that the size of the aircraft overwhelmed them. 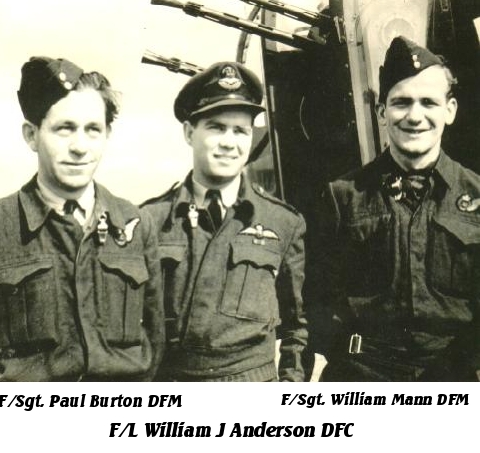 By now P/O Anderson with the addition of one more gunner and a Flight Engineer had his complete crew of six men. All relying on him and in turn all relying each other. Getting ready to meet all possible upcoming scenarios was not limited to aircraft or jumping into a wet dingy. Each airman at some point prior to joining a squadron underwent Commando hand to hand combat training. 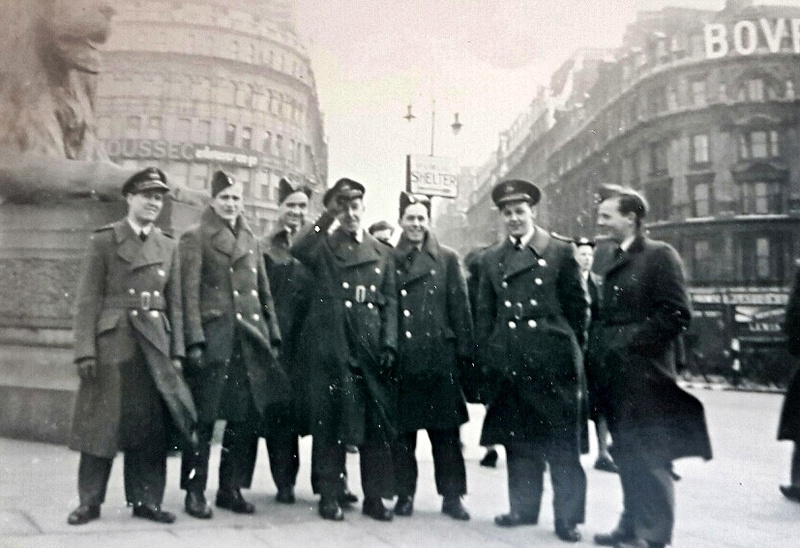 The airmen were stripped of their ranks and became privates in the Army. And if they had thought their prior course instructors were a hard bunch they had would find a new level of "keenness" in these Army and often actual Commando instructors. The air crewmen were toughened up with the typical Army 10 mile marches and worked up to much further distances. Then there were the exercises were they had to find their way back to base. On these exercises based on actual events recorded by Mooseman Robert Porter; the men would be taken some distance from camp dropped off somewhere unknown to them and then find their way back within a given time period. They could not use roads or any public transit source. Being without money may have been an obstacle to this in some cases, but if they did manage to catch a ride on a train or bus then found out, it was back to the beginning spot and start all over. The Police and Home Guard would be on the lookout for them as well as the instructors, also just being caught would mean restarting all over again. If only that! While his crew had a chance to settle into their new digs at Middleton St. George after arriving from No. 1664 CU to 419 Squadron F/O Anderson found himself selected for 2nd. Pilot duties for that very night April 10th. 1944. Anderson's crews first operation together was to be a Garden op. F/O Anderson had already completed one of these mine laying operations a week earlier while on his second sortie as 2nd. Pilot and was aware of the flying skills needed to complete the job. The squadron's days of flying the Halifax were coming to a quick close, the Anderson crew completed three more operations in the Halifax. Two of these three ops. were to be ones for the crew to remember. On the night of April 22/23 1944 while flying JP131 VR-S over the target area F/O Anderson and the crew were hit heavily by the defending flak batteries. S for Sugar was so heavily damaged it would never return to operations with the squadron. It was trucked away later classed as a Category Ac, an aircraft in need of repairs beyond what could be completed at its base. The second op. and their last one on the Halifax was to Montzen. It was not to be an easy operation for the 144 aircraft involved in the attack. The German fighters were waiting for them especially those in the second wave. In total 15 aircraft were lost on the raid. The transition to the Lancaster took place in May of 1944, now a Flight Lieutenant, Anderson flew a variety of different aircraft. One in particular flown on several occasions was KB720 nicknamed "Piddlin Peter" and an aircraft that seemed to draw damage. Whether it was attacks from fighters, flak or having a bomb dropped on it; KB720 received a lot of damage in it's 31 sorties. By July of 1944 F/L Anderson and crew were flying KB765 VR-Q almost exclusively. The first Lancaster carrying the VR-Q on her side. But it would not be VR-Q or Piddlin Peter which would bring honor to the Anderson crew it would be "X-terminator". KB732, VR-X would become one of the most famous Lancasters of the war. "X-terminator" would be the first Canadian built Lancaster to bring down an enemy fighter. Anderson's gunners F/Sgt. Mann and F/Sgt. Burton were the men behind the guns of this milestone for 419. For their part in bringing down the Ju88 both Sgt. Paul Burton and Sgt. William Frank Mann were awarded the DFM. For the Anderson crew this was not the only attack they had survived. F/L Anderson in an earlier sortie had thrown his aircraft around through a series of evasive maneuvers to shake off an attack by three enemy aircraft. 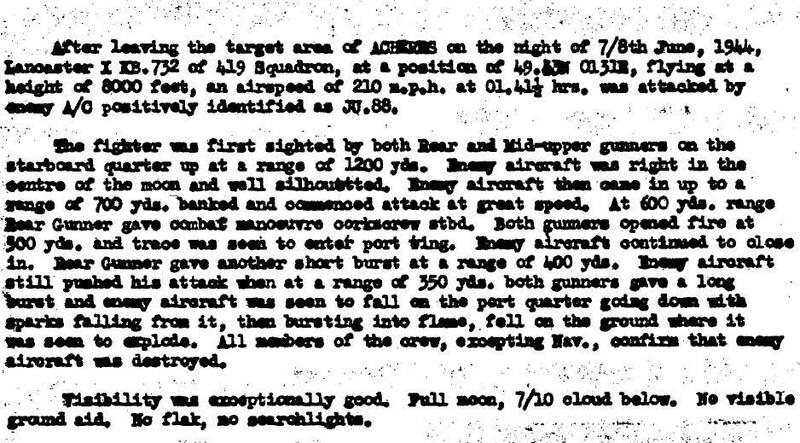 And his skills during the night of July 6th over Acheres had won him the DFC. "This officer has completed numerous sorties and has displayed courage and resolution of a high order. On one sortie his aircraft was attacked by three enemy fighters. 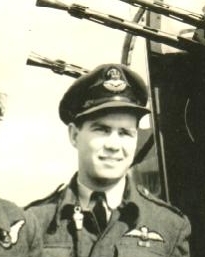 Flight Lieutenant Anderson skilfully outmanoeuvred the attackers and went on to execute a successful attack. On another occasion when over Versailles his aircraft was intercepted by a Junkers 88. In the ensuing fight which ended with the destruction of the enemy aircraft, Flight Lieutenant Anderson displayed great coolness and determination." The F/L William Anderson crew was a well decorated crew who continued on operations up until September 12th 1944 completing their Tour. In October of that year the crew were screened and Anderson, Steele, Bailey and Burton were posted to 64 base for "testing duties" . No mention in squadron ORB as to where WO Bailey was posted. He too could have followed the others to 64 Base. Sgt. Uden returned to RAF for future postings.